Monarch butterflies are familiar to most people as a welcomed garden visitor. They also have become a poster insect for the need to preserve wildlife and wildlife habitat. But in May 1999, the monarch took on another role — as the center of a tornado of controversy when a small laboratory trial was published that appeared to indicate that the pollen of genetically modified Bt corn presented a threat to monarch caterpillars. Although this experiment in no way duplicated natural conditions under which monarch caterpillars may come in contact with corn pollen, mainstream media reported that monarch butterflies were threatened. Considering the popularity of monarch butterflies, the public outcry that followed media reports that pollen from transgenic corn was killing monarch butterflies was not surprising. These media reports had the effect of heightening public awareness and increasing scrutiny of transgenic plants in terms of potential environmental impact. The reports also intensified one of the most controversial and polarizing issues to face agricultural scientists in recent memory. Often, such a public outcry drives decision making in advance of true scientific evidence. But in this case of Bt corn and monarch butterflies, an attitude prevailed, even among groups with differing agendas, that decisions about transgenic plants should be based on the weight of scientific evidence. In response to the furor in the media and the public, a group of public and private scientists designed multi-faceted studies to answer questions about Bt corn pollen and the monarch butterfly. They published their findings as a group after rigorous scrutiny of their work by the scientific community. 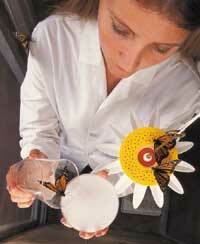 Their scientific evidence shows that the risk to the monarch butterfly by Bt corn pollen is negligible. The steps taken by these scientists represent a model for risk assessment research of genetically modified plants. Further, the work represents an important example of allowing science to guide decision making. The scientific evidence shows that the risk to the monarch butterfly by Bt corn pollen is negligible. The steps taken by these scientists represent a model for risk assessment research of genetically modified plants. Further, the work represents an important example of allowing science to guide decision making.